I failed to compete in yesterday’s topic as my only diecast from ‘Murica was still somewhere in storage. So I’ll try to make up for that by entering one of the most Teutonic monstrosities ever. A true number 1. The infamous Porsche 935. And the ride height immediately gives away it’s scale: It’s a 1/64. From the small series of 1/64 Minichamps did not thay long ago. Sold for 6 euros but as there were only 5040 made it will prove to be hard to find one for that kind of money nowadays. Don’t ask me why Minichamps did 5040 pieces instead of 5000, that’s something they always do, it’s part of the heritage so to speak. So are the details on this one, just look at all those tiny decals. It’s Flachbau nose was an inspiration for lots of 911 owners to want the same but that story is widely know. As is it’s racing history. 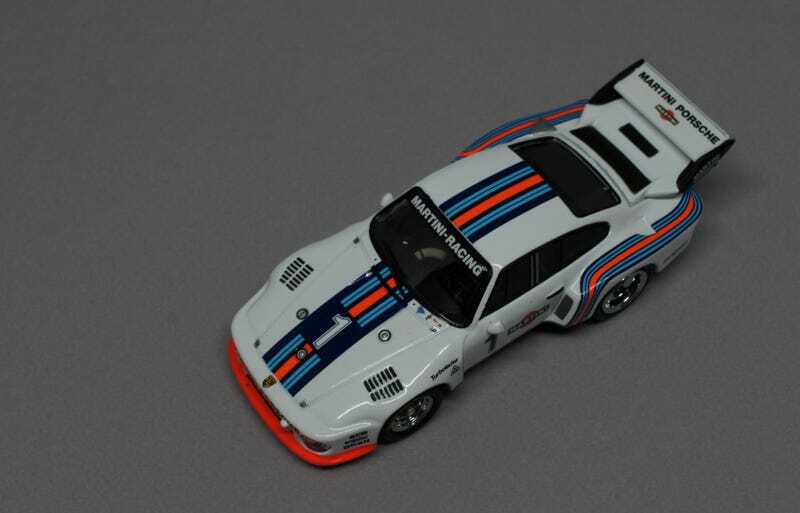 It won over 150 races but winning the ‘79 24 Heures du Mans probably is what the 935 is most known for. Enough from me, I’ll have to let these pictures do most of the talking for LaLD Car Week anyway. Here she goes. So, das war es wieder. Viel glück mit Ihre Eintrage. Tschüss!